Your AR-15 handguard has huge implications in terms of how much you enjoy your shooting experience. Our M-LOK handguard offers more than just the accuracy enhancements that come with a free-floating rail. It features a full-length picatinny top rail that sits flush with M4 flat top receivers allowing you to have more space for optics and back up iron sights. The slim profile is comfortable to grip while still allowing enough room for low profile gas blacks underneath. This AR-15 handguard is machined from 6061 aluminum, has a hard coat anodized black finish, and generously sized M-LOK cuts for air circulation. This lightweight handguard features a slim profile with M-LOK attachment points along the full 7” in length. It is machined from 6061-T6 aluminum and has a type III hardcoat anodized finish for excellent corrosion resistance. This AR-15 free float handguard is compatible with all Mil-Spec upper receivers and most low-profile gas blocks, so you have the freedom to build your rifle the way that you want. It is easy to install with the included barrel nut and mounting hardware. CBC precision AR-15 rails and handguards provide a dependable option for your AR attachment needs. 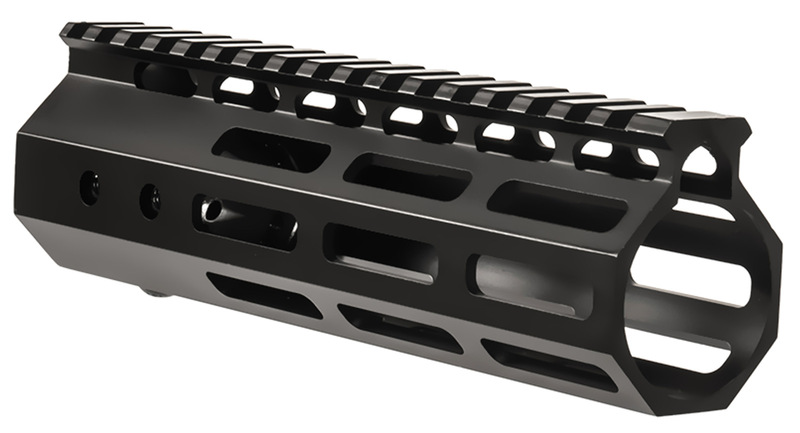 CBC manufactures and retails a wide selection of AR-15 rails in a variety of lengths and attachment configurations including keymod, M-LOK, and picatinny options. The quality of our AR-15 rails are backed by a Lifetime Warranty – if any CBC rail or handguard is defective, we will repair or replace it at no charge. Get your AR-15 rails at CBC today and save with free shipping on eligible orders!